I was recently reading an article that stated that one of the first things people notice about someone else is their hands. I thought this was a little strange, as I typically look at someone's hair or eyes before glancing elsewhere. But, it makes sense when you consider that you often shake a hand when being introduced and, if you're animated like me, use your hands while talking. But, unfortunately, the earliest signs of sun exposure & aging show up first on the hands, sometimes even before they appear on your face. So, it spurred me to think a little bit more seriously about how I am caring for my hands on a daily basis. at night before bed for a deep moisturizing treatment. And don't forget to protect your hands with a hefty dose of sunscreen when heading outdoors! Because it's one of the first places where the eye is drawn when you meet someone new, why not add some subtle sparkle? Layering dainty rings feels fresh right now and it's an easy trend to try without investing a fortune. Wear one on each finger or layer them together for even more of an impact. I'm a little obsessive about always having my nails painted, thanks to my mom who was & still is the same way. 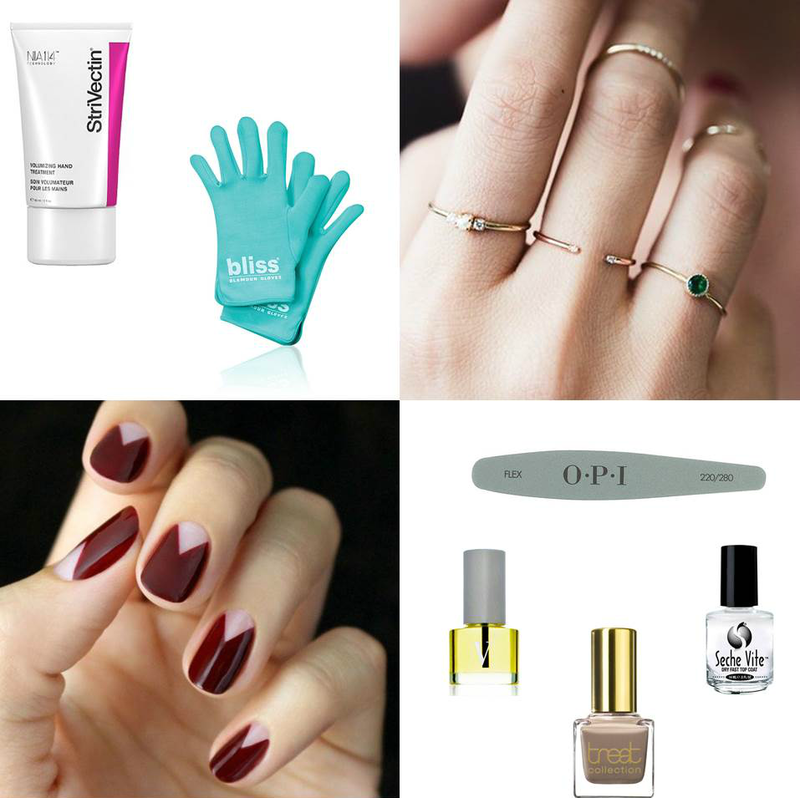 I shared my tips for achieving a flawless at-home manicure over four years ago and these are still the steps I swear by today. Looking for a little nail inspiration?